Last week we began to discuss inspiring modern stair designs. Gaining in popularity, the trend toward this innovative and cutting edge look continues to escalate into high demand for architects, general contractors and home builders alike. When it comes to building a new home or commercial building with modern style, it is imperative to consider various contemporary staircase design options, giving a vastly different look to the common traditional stair. When placed in the best location they can improve on the number of ways in which the interior can be designed. If you are interested in modern stairs make sure to consider these clean and sleek options. Featuring a straight, scissor stair design and stained red oak treads, this modern staircase is the perfect consideration for residential properties. 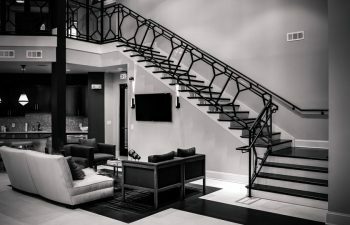 The custom-made wood handrail system encompasses a Chippendale pattern creating contemporary appeal, with a custom switch from classic wooden balusters. Sure to meet your interior decorating style, this cutting-edge handrail is custom cut on the CNC with exemplary detail. The openness of the balusters allows a great amount of natural light to flow throughout the home. 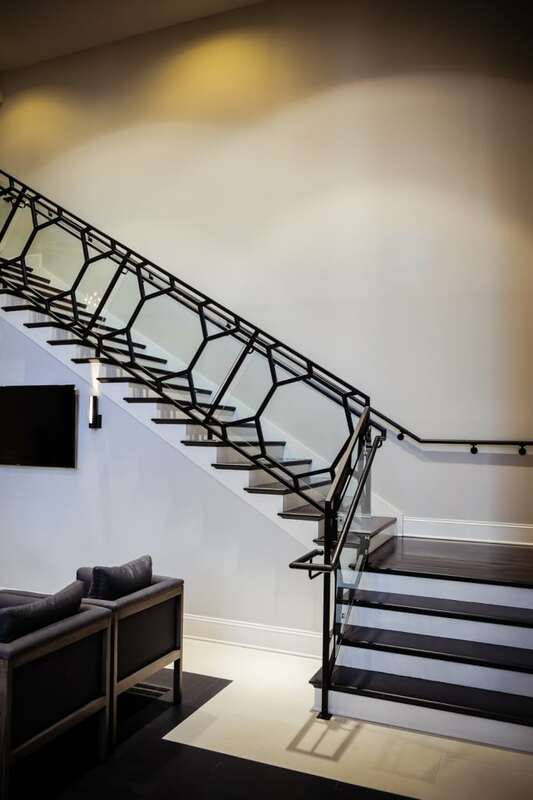 Another alluring example of cable rail, this straight staircase is a multi-level scissor design with open rise treads. Also manufactured for residential use, the classic red oak wooden treads take on a modern twist. When combined with the cable railing system, the structure allows light to pass through from the windows enhancing natural light throughout the house. 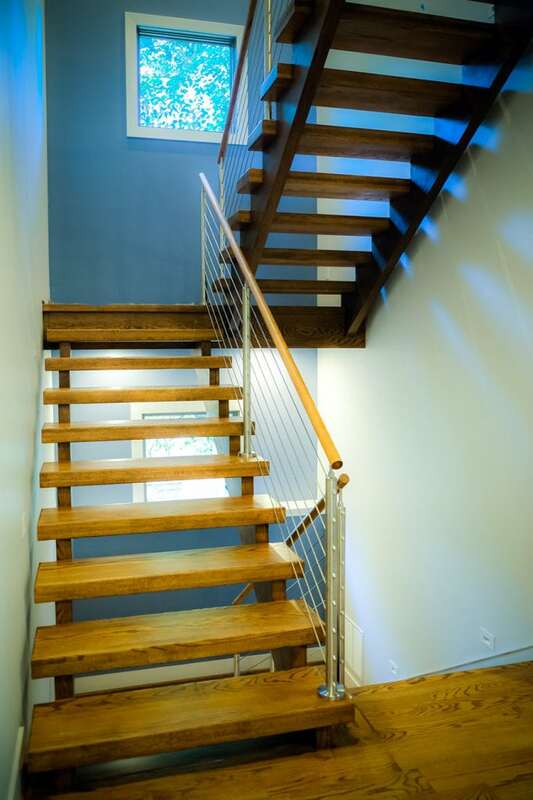 If a sleek staircase is the style you desire, this lustrous cable railing system is sure to meet your needs. Moving next to commercial stairs, as featured in a previous blog, this superior staircase is one of our favorites to highlight. The straight commercial stair is the essence of modern design. 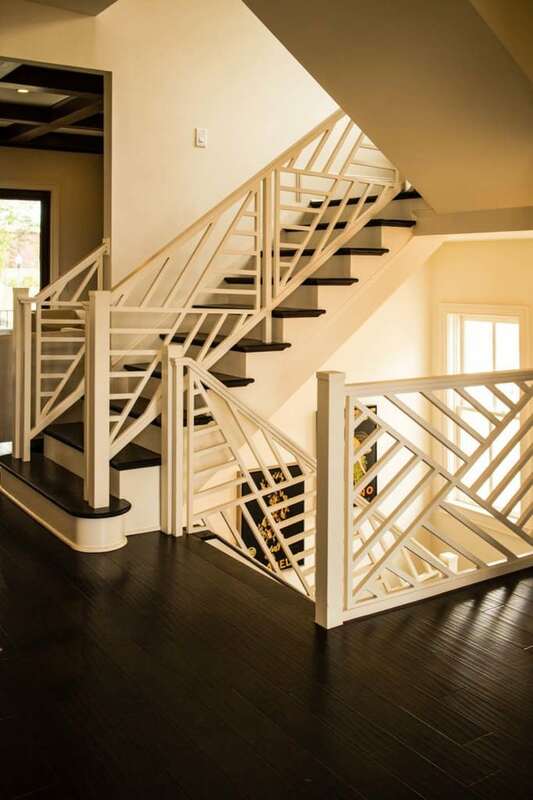 The maple treads and custom wrought iron handrail system give the stairs a contemporary appeal, with the combination of innovative ornamental metal and glass panels that are sure to impress. The clever use of black and white colors creates a modern twist on a classic design, providing an inviting feel to this commercial space. The custom honeycomb design of the handrail system makes an automatic statement to your guests and customers. Now that we have given you modern inspiration over the last two weeks, you may be asking why you should choose Artistic Stairs and Southern Staircase for your next project? The answer is simple. Our 30 year commitment to high quality products and expert stair craftsmanship lets us soar ahead of our competition. Our industry leading design technique comes with an innovative approach only we can offer. We provide seamless project management with a strong commitment to meeting schedules and delivering results. Our in-depth knowledge of codes and regulations means you don’t have to worry about the quality or safety of your new modern staircase. We are a national company, working from coast to coast. Whether your project is in beautiful San Francisco or sunny Miami, you can rest assure we will manufacture and deliver a beautiful contemporary staircase design.